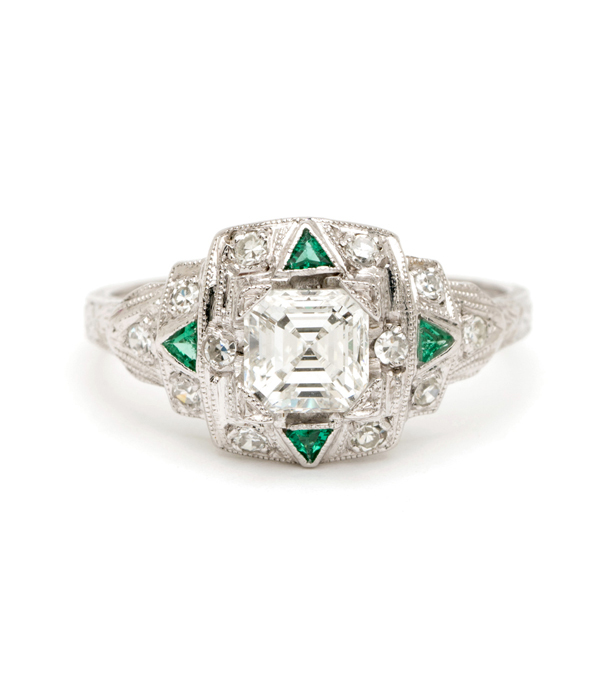 The Asscher cut was first developed in 1902 by Joseph Asscher, and became popular in the Art-Deco movement and following World War I. Although similar to an emerald cut, the Asscher cut’s 58 facets are larger and wide-set (three rows on the top, three rows on the bottom), and the stone is nearly octagonal in shape. Joseph Asscher saw an opportunity to better use rough diamond crystals to his advantage, therefore retaining more weight than the stone could with other styles of cutting. 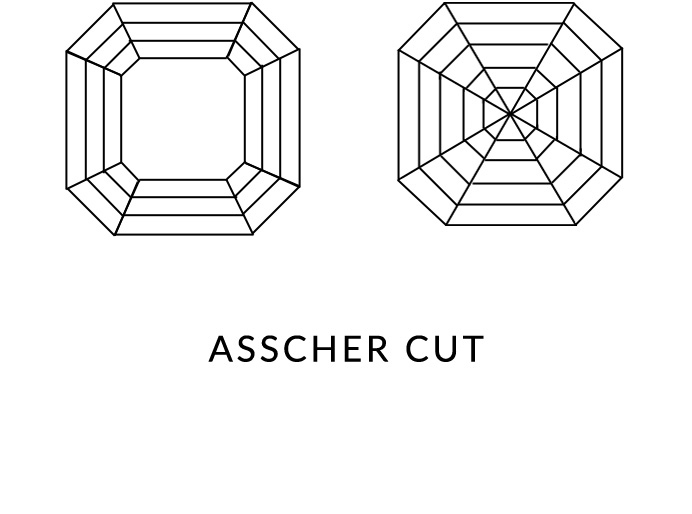 Because of the shape of the stone and the way the facets are cut, Asscher cut stones retain a classic appearance with a better balance of scintillation than a similar emerald cut, while still exhibiting a quieter aesthetic than a modern brilliant style cut. Although the original Asscher cut is mostly seen in Art-Deco style jewelry from the early twentieth century, two very important (and world-renowned) gems carry the Asscher name. Originally cut from the same 3,105 ct. rough diamond by Joseph Asscher and Abraham Asscher, the Cullinan I diamond and the Cullinan II diamond are two of the most famous stones in the world. The pear-shaped Cullinan I, at 530.20 cts, sits atop the royal scepter in the British crown jewels, and the cushion-shaped Cullinan II (317.4 cts.) lies in the British imperial state crown. 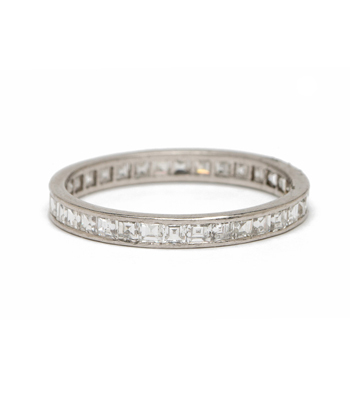 Over the last ten years, it seems as though mentions of Asscher cut diamonds in popular bridal media has increased in the United States, which may be due to Edward Asscher’s redesign of the diamond. After visiting the GIA’s International Gemological Symposium in 1999 and realizing that the Asscher cut was still popular in the United State, Edward Asscher (grandson of Joseph Asscher, who created the original cut) returned to the Netherlands with an idea to craft a new, more dynamic species of Asscher cut diamonds, with even more brilliance and shine than before. The Royal Asscher cut diamond boasts 16 more facets than the original Asscher cut’s 58, allowing the diamond to catch light much better. Edward Asscher added two additional rows of eight facets each to the bottom of the stone, and subsequently making the rows narrower, he was able to keep the classic feel of his grandfather’s original cut while making the stone’s appearance more dynamic. With both the Asscher cut and the Royal Asccher cut, these angles and proportions used are critical to the beauty and brilliance of the diamond.